Above a garage in coastal Maine, there is a magical place where gnomes go backpacking, buoys guide lobstermen, and bear buddies climb into igloos for the night. Each lovingly-crafted three-dimensional fabric character has a story to tell. 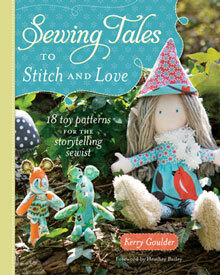 Through her new book, Sewing Tales to Stitch and Love, Kerry Goulder hopes to inspire other storytelling crafters to spread this magic throughout the world. At first glance, her book looks like any other craft book on the shelf at your favorite fabric or hobby store. 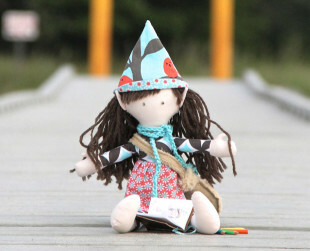 There are patterns and instructions for making various fabric toys. Anyone not into sewing crafts might not pick up this book. But there is something deeper going on here. In fact, some writers spend a lifetime trying to do what Kerry has done out of love. She has given each creation a name and a story. When you actually read Sewing Tales, you learn where each toy has lived, what stories they have to tell, and how they might fit into your world. 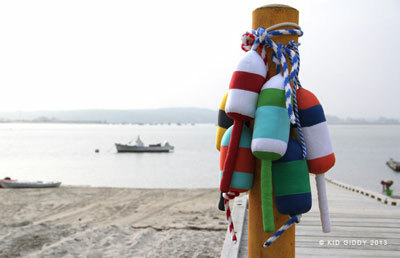 Retired buoys are a common sight in many coastal towns. The second chapter of the book, “Coastal Waters,” is filled with seaside projects inspired by Kerry’s life on the East Coast. Kerry’s real-life Uncle Bob loved to catch lobsters in the wooden traps at their family’s summer home in Greenport, New York, when he was young. Kerry writes that this retired buoy “was pulled from the water one last time,” a loving tribute to the fond memory of her uncle. The little mommy in the book creates a home for her doll children. Kerry has always been encouraged to play, pretend, and create. The daughter of an art teacher, the twin sister of an artist, the wife of a graphic designer, and the mom of two imaginative girls, Kerry is surrounded by and nurtures creativity and storytelling. It was, in fact, Kerry’s daughter and everyday life that jumpstarted her on this journey nine years ago. When her infant daughter’s blanket kept falling out of the car seat, Kerry turned her frustration into invention and crafted a blanket that would stay. 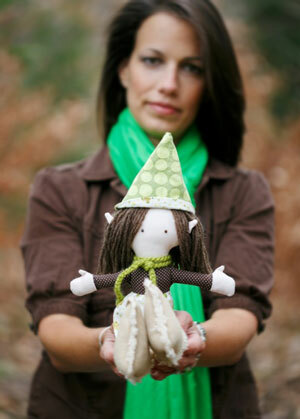 The Tuck ’n’ Go® was Kerry’s first novel product, launching her company 2 is Beautiful LLC and her Kid Giddy creations. Patent costs and manufacturing restrictions deterred Kerry from mass producing the Tuck ’n’ Go®. She sold a few on Etsy.com, mostly to fund her growing hobby of buying more fabric. As Kerry played with ideas for making unique stuffed toys, her karate friend Phoebe suggested she send her ideas to (then) Crafts ‘n Things magazine. 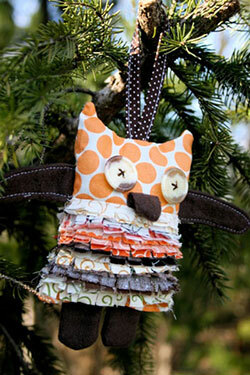 The editor really liked her ideas and Kerry’s owl pattern ended up on the front cover. Following the overwhelmingly positive response, the editor asked Kerry to write a series for upcoming issues. Kerry began going to craft and hobby conventions. At one, she walked into Anna Griffin’s booth and expressed her dream to create patterns for the artist’s company. The opportunities began to fall in place. Through her showcase and press kits at the shows, Kerry generated interest from publishers. An editor from KP Craft, an imprint of F&W Media, the world’s largest craft and art media entity, called Kerry after a show and asked her to submit a proposal. She needn’t wonder any more. Kerry’s patterns and stories are making their way across the continents, in hobby shops from the UK to Australia. Author photo by Nadra Edgerley. All other photos copyright Kid Giddy and courtesy of Kerry Goulder. Karen Pavlicin-Fragnito has stitched many special projects, including designing her own wedding dress and creating an heirloom friendship quilt, but her favorite part is sharing the stories that thread them together. She was once married to a buoy named Bob from Long Island. Connect with Karen on Twitter, Facebook, Web, or email. This article was first published January 2014.